Will Froome wear yellow in Colorado? Will Peter Sagan wear green? Big news today as it was officially announced that Chris Froome will race in the 2013 USA Pro Challenge. 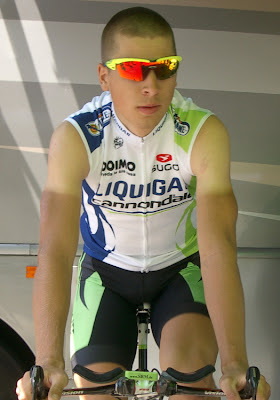 VeloNews also published the news that Cannondale officials have confirmed that Peter Sagan will race in the 2013 USA Pro Challenge as well. This is huge news for the UCI 2.HC stage race tour in Colorado. The race is on, and if I were Tejay van Garderen, Christian VandeVelde, or Tom Danielson or Tyler Farrar - I'd be shaking in my boots knowing how much this competition across the high altitude mountains of Colorado is going to hurt. Interestingly enough Joe Dombrowski who won the Best Young Rider jersey last year at the USA Pro Challenge for Bontrager, is now riding on Chris Froome's team SKY. With Richie Porte, Dombrowski and Froome all on the same team - this could be a big year for SKY in Colorado! This will definitely be a big year for cycling fans in Colorado! Chris Froome, Ian Boswell, Joe Dombrowski, Danny Pate, Peter Kennaugh, Richie Porte, Kanstantsin Siutsou, and British neo-pro Josh Edmondson. The other good news is that Jens Voigt will be next door in Utah racing the Tour of Utah the week before the USA Pro Challenge, I hope he stops by Colorado after. Chris Horner will be racing the Tour of Utah as well, but he is on the roster to ride the Vuelta, so that means no Colorado. Also headed to the Vuelta a España this year are Ivan Basso, Vincenzo Nibali, Jakob Fuglsang, Alejandro Valverde, Igor Antón, Samuel Sánchez, Carlos Betancur, Bauke Mollema, Sergio Henao and Rigoberto Urán. Alberto Contador says he will not be at the Vuelta in 2013. Part of his team however will be in Colorado, which part - I am waiting to hear. Peter Sagan's team announced that he will be racing in Colorado. Sagan was here in 2011, but not in 2012. Wait ... this means Bernie Eisel isn't coming to Colorado with Team SKY - darn! Awh well, I can't wait to see who else will be racing in Colorado in 2013! Hopefully the full startlist of riders will be announced soon.